LACING: Very nice. Lingers high up the glass in sheets. NOSE: Exceptionally complex and exceptionally well-balanced. Massive variety of fruit aromas…orange, lemon, banana, pineapples and peaches. Big hints of vanilla and spice. A warm, tingling whiff of peppery bourbon. All of those notes are held together by a big, fresh-baked biscuit backdrop with a generous aroma of yeast. TASTE: Everything is more subtle in the taste. Less fruit. Less yeast. Less spice and booze. It’s citrus up front, sweet pale malt and vanilla in the middle, and a touch of drying bitterness in the finish. For all the bold notes in the nose, the flavor is actually quite delicate and refined. MOUTHFEEL: Medium-bodied, but bright and effervescent. Tingles like champagne. 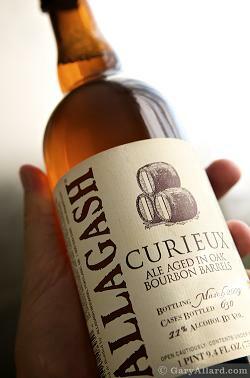 DRINKABILITY: For an 11% tripel, the Curieux is remarkably drinkable. The alcohol is present in the finish, but so well-incorporated that you would have no idea how strong this sucker is. Subtle flavors and a captivating nose add to the drinkability. Posted in Tasting Notes.Tagged Allagash, Curieux, Tripel, Washington DC.